Do you like the Slant Bar razor? Poll: How do you like the Slant? I've used a Slant & love it. I've used a Slant & it's okay. I've used a Slant & it's not for me. I've not used a slant. On the sub-reddit Wicked_Edge, a participant recently told me that the Slant Bar razor has what he terms a high "level of dislike that style of razor has on the Internet." I was surprised, because I had thought that around 85%-90% of the guys who tried the Slant really liked it a lot. Obviously, in a YMMV activity like shaving, one doesn't see universal praise (or condemnation---some people love Merkur blades, for example) for anything in shaving. Still, the guy seemed quite upset that I am praising the Slant when I apparently represent something of a minority opinion. So, a poll might help. I hope the poll works, but in any event it would be interesting to read a sample of comments from guys who have tried the Slant razor. I had a Merkur slant for a little while, and although it was OK, it didn't work for me any better than my other DE razors, and I sold it. My operating theory was that it wasn't great for me because I am left handed - but that may just be nonsense. I wonder how Jerry (Slantman) voted. I was Pif 'd slant a couple of years ago and never got to using it before pifing to some one who was eager to try one. i wish i had tried it now especially when I read of DE shavers using it as their only razor. I think Johnny9 springs to mind here, could have got that wrong though! I don't feel as though I have a solid opinion on them yet. I had the long handled one, but it was just too clunky for me. I'd like to try the shorted handled slant one day so I could get a better opinion. My Merkur Slant is one of my favorites. I prefer it now over my 34C although that was not the case when I first started DE shaving. It gives me a closer shave that requires less effort. Because I know I need very little pressure for it to be effective I usually have no irritation. (05-23-2012, 09:10 AM)4711 Wrote: I was Pif 'd slant a couple of years ago and never got to using it before pifing to some one who was eager to try one. I've used many razors and nothing works for me as well as a slant does and is indeed the only razor I use. When I see a razor I've never tried, I try it, but the results are typically the same--back to the slant. 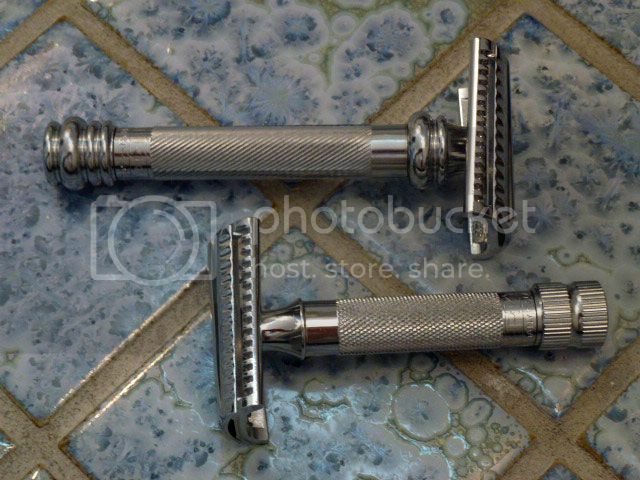 SE's are, IMO, the only razors that can offer up a similar shave, but I still prefer the slant. I think the explanation for this is simply the availability of higher quality DE blades. I'm excluding straight razors, but even with a straight I prefer near wedge or quarter hollow to a full hollow blade. It seems I require a rigid blade. My most recent non-slant shaves have been testing out the Bulldog Old Type and the Bell Tube Aristocrat. Both are nice shavers, but not as effective as the slant. My face is a complicated mess. Dense, coarse, hair growth in many directions, sensitive skin, hills & valleys, cliffs & peaks and an Adams apple like a strawberry. I like most razors too but I absolutely *LOVE* the Slant. I have the 39c Sledgehammer and I bought it after only wet shaving a few months. I do not find it overly aggressive no matter what blade I use and I always get a fantastic shave that doesn't seem to require the extra vigilance that an aggressive razor like the 2011 R41,(which I also use) requires. I agree with Travis; "a closer shave that requires less effort" and if I didn't have RAD, I would be most happy with the Slant being my one and only. I have several slants and with one exception, they are very good and I love them. As mentioned earlier a GEM, Ever-Ready or Star, single edge razor can deliver an equally good shave, but I think the slant makes it easier. That being said, I use the SE's everyday because I like using older razors. So far, my Merkur 37C slant bar has given me the closest shave of all my razors. It could well become my favorite, but I haven't tried the 39C yet and my Tradere is in the mail. (05-23-2012, 08:57 AM)bullgoose Wrote: I wonder how Jerry (Slantman) voted. I have a 37C that gets used on occasion. I still want a cased Hoffritz and keep missing out on em on the bay. I love the Slant. It's quick and efficient and does a great job. I have discovered that slant works best for me with a milder blade. i tried the 39C Sledgehammer and it was not compatible with my neck! Once i got my open-combs, never looked back. i should try it again to experiment! (05-23-2012, 06:46 PM)celestino Wrote: i tried the 39C Sledgehammer and it was not compatible with my neck! I do have to be very gentle on my neck when using the 39C but it does well. The OC SEs though are still my favorites. Slants give very good shaves but I do love DE variety. There are only so many slants. I've never used a slant, so I don't know! I have both the Merkur 37c and 39c. I could not decide between them (short or long handle) so I just got them both. They are find razors and I use one or the other in my regular (random) razor rotation. (05-24-2012, 05:13 AM)turtle Wrote: I have both the Merkur 37c and 39c. I could not decide between them (short or long handle) so I just got them both. Turtle, other than the obvious weight & handle length differences, can you notice any difference in how they shave or the results they give? It's all a personal preference thing. Do you like long handles or short handles? I prefer longer handles as I have shaved with a long handle super adjustable for over 40 years. BUT I like a short iKon bull dog handle on my R41 as it just does not behave well with a long handle. I like the knob on the short handle slant (37c) but the length of the 39c. I find the modified ball end of the 39c a little odd feeling in my hand. Maybe I will have Bob machine a custom knob for the 39c when he returns. That would be the ultimate slant in my mind.